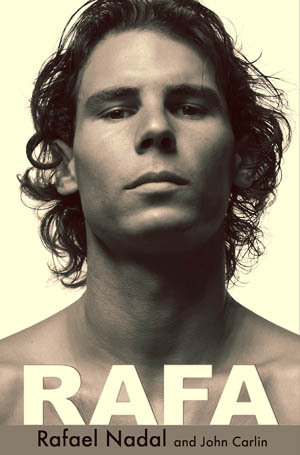 Being a Rafa-holic bears no swaying of my vote to liking RAFA the auto-biography written by Rafa Nadal & John Carlin. The book is well written in a memoir style where Rafa goes back & forth from Wimbledon 2008 up until winning the USOPEN 2010. He also talks about Davis Cup 2004 where his opponent was Andy Roddick. To which I am grateful that he spoke of this match in particular since it was the very first match I saw him & was literally hooked! The book is centered mostly on Rafa's insight into his matches. The most important one's to him, the ground breaking ones. Rafa's story is told into flashbacks of his childhood, his relationships with his family, his coach Uncle Toni, & the entire Team Nadal. He talks about his fears, his passion, his competitive spirit & how it feels to be driven by the need to win. His pains, the hurt he feels on & off court. Injuries, his dreams of being a footballer, the pains of not having a normal childhood. The pains of what it takes to be the mental warrior that we all love today. The good human being that is Rafa. I always wondered what he was actually feeling on court & who he is as a person, because we really cannot tell during an interview after a match on who Rafa is really..let's be honest Rafa never reveals anything new in his interviews in the tournaments he plays in. But this book allows us to divulge into Rafa's mind to better understand him as a tennis player, a son, a brother, and a hero. I won't post details or quotes that to me might be misleading, you have to read the entire book to understand the entire story. I will post what I think is my favorite quote in the book. I want you all to experience the book in your own way.. so please reserve any judgements you might have read in other reviews. "One lesson I've learned is that if the job I do were easy, I wouldn't derive so much satisfaction from it. The thrill of winning is in direct proportion to the effort I put in before. I also know, from long experience, that if you make an effort in training when you don't especially feel like making it, the payoff is that you will win games when you are not feeling your best. That is how you win championships, that is what separates the great player from the merely good player. The difference lies in how well you're prepared." Buy this book you will not be disappointed!